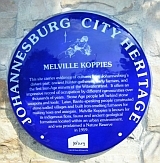 Melville Koppies is a Nature Reserve and a Johannesburg City Heritage Site. It is the last conserved remnant of Johannesburg's ridges as they were before the discovery of gold in 1886. Its geology goes back three billion years. Stone tools show that Early Stone Age man camped here as long as 500 000 years ago. There is a Late Stone Age living floor. Within the last 1 000 years Iron Age immigrants arrived, and remains of their kraal walls can be found on the northern slopes. In 1963 an iron-smelting furnace was excavated and can be seen today. 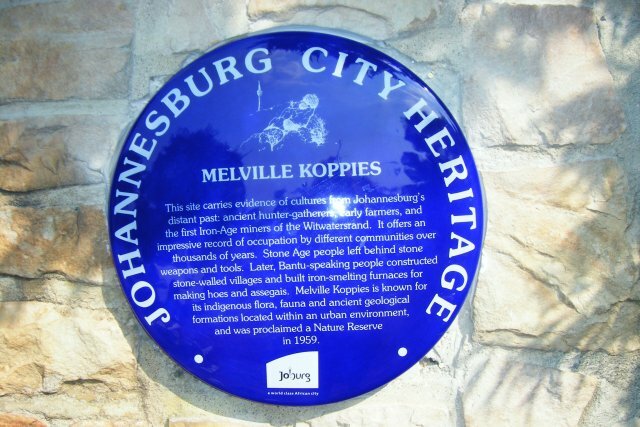 The vegetation of the Koppies is entirely indigenous and is a remarkable example of the richness of highveld grasses, flowers, and trees so close to a city centre. These ridges have looked like this for hundreds of years. Please refer to the calendar/map for details of organised tours. Melville Koppies CENTRAL is always locked and has CONTROLLED ACCESS ONLY for people on organised tours and hikes. Please refer to calendar/map for details of scheduled tours and hikes. Other tours may be booked on 011 482 4797. People may not walk around this section on their own at any time. Melville Koppies EAST is open daily for walks and socialised dogs are welcome. Melville Koppies WEST is open daily but it is advisable to walk only on scheduled walks. Do not take valuables onto EAST or WEST as these are public open spaces. No braais, camping, picnicking, radios, mountain bikes or vehicles. This site is not compatible with IE6 or lower.